Heres one not to be missed next week. Stolenspace are proud to present: Conor Harrington - 'A Quiet Riot' Exhibition in London. For those of you who haven't heard of Conor Harrington yet, he is featured in the current issue of Graphotism and was part of "these are a few of our favourite fiends" show earlier last year at The Outside Institue Gallery. 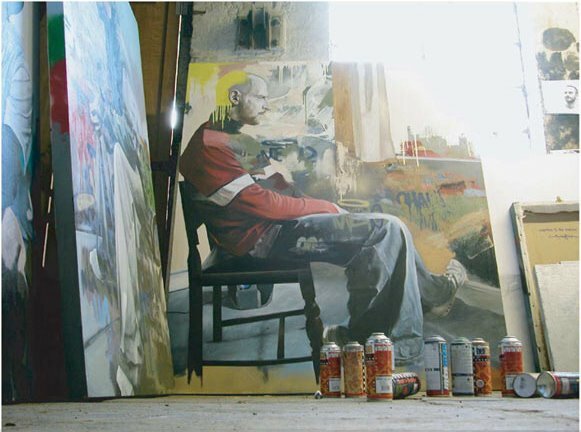 His work is a result of both formal and informal training in fine art and graffiti, using both oils and spray paint his work features opposites and contrasts and the tensions existing in such relationships when taking two opposing elements to develop a visual language. Set up by the street artist D*Face, Stolenspace is the only dedicated urban contemporary art gallery, whose new home is at The Old Truman Brewery in East London. Check some more of Conors work here.